One of the best-known Scottish politicians of his age and Walter Elliot's noteable initiatives included the provision of free milk for school children and the formation of the National Housing Company which produced prefabricated housing for Clydeside. Elliot was elected Conservative MP for Lanark in the 1918 General Election, lost his seat in 1923 but returned as MP for Glasgow Kelvingrove in 1924. He was Parliamentary Under-Secretary for Health in Scotland (1924��"26) and joined the Cabinet in 1932 as Minister of Agriculture, later becoming Secretary of State for Scotland (1936-38) and Minister of Health (1938-40). With experience in both the Ministries of Agriculture and Health, he was well placed to argue that controlled milk production would help both the recession and child malnutrition. As chair of the Empire Marketing Board, he made funds available for research into the marketing of dairy products, including the feeding of milk to school children in Scotland. This research was carried out by John Boyd Orr and his research team at the Rowett Research Institute (1926-28). "the only conclusion possible is that they [the results] have a wide public health significance, especially with the nutrition of school-children." In November 1929, he introduced the Education (Scotland) Bill into the House of Commons as a private member, with a view to allowing Scottish Local Education Authorities to provide free or subsidized school milk. The costs involved in the scheme meant that it was not a success. Elliot was also behind the Milk Act 1934 which established a 'Milk in Schools' scheme run by the Milk Marketing Board, with the aim of supplying a third of a pint of milk daily to 50 per cent of elementary school children, either at half cost or free. This was achieved by 1939. Born 19 September 1888, Lanark, Scotland. Walter Elliot Elliot (1888-1958) was a University graduate and Conservative Party politician. He served as Rector from 1947 to 1951 and the Elliot Library in Glasgow University Union is named for him. Born in Lanark, Elliot studied Science and Medicine at the University, graduating BSc in 1910 and MB ChB in 1913. During his student days he formed a lasting friendship with a fellow medical student and Union stalwart OH Mavor (who later became famous as a playwright under the pseudonym James Bridie). He was editor of Glasgow University Magazine from 1909 to 1910, President of the Union from 1911 to 1912, and was the co-author of the Union song, Ygorra. Elliot served as a Medical Officer during the First World War and was awarded the Military Cross and bar. You can find more information on his war service on the University of Glasgow's World War I Roll of Honour. In 1918 Elliot was elected MP for Lanark. He lost his seat in 1923 but the following year was elected to represent the Kelvingrove seat in Glasgow. He was appointed Minister of Agriculture and Fisheries in 1932 and Secretary of State for Scotland in 1936 and he served as Minister of Health from 1938 until 1940. In a by-election in 1946 he was elected to the Combined Scottish Universities seat, just a year after losing Kelvingrove, but he was re-elected to represent Kelvingrove in 1950. Elliot was a centrist who acquired a reputation for progressive politics. He supported devolving powers to Ireland in 1920 in the Ireland Act, was an enthusiast for the Empire Marketing Board, free milk for schoolchildren and greater intervention by the state to improve people's lives. He had an impressive record of fighting Scotland's corner, especially in housing, where he set up the Scottish Special Housing Association to stimulate more action on building and design. On the national stage, as Minister for Agriculture he helped pull farmers out of a period of slump in the markets. As Minister of Health he made a major contribution towards preparedness for war, both in hospital reorganisation and in the planning of an evacuation scheme that was put into action. 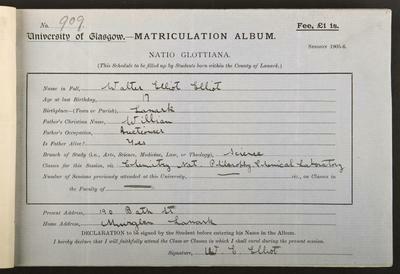 As well as politics, Elliot continued to pursue academic research after the First World War. Following an invitation from John Boyd Orr (who he became friends with in the Officers' Training Corps before the War) he worked on a project on pig nutrition at the Rowett Research Institute in Aberdeen, and spent his vacations researching there. Based on this work, he completed a thesis for which he was awarded a DSc by the University in 1923. Elliot was awarded and honorary LLD degree in 1937 for his work as Secretary of State for Scotland. He was elected Rector in 1947, defeating his old friend OH Mavor and another former Secretary of State for Scotland, Tom Johnston, in the process. After he left Parliament he farmed, ran a family business and did some writing and broadcasting. Walter Elliot died of coronary thrombosis on 8th January 1958 and is buried in Hobkirk churchyard. Boyd-Orr, Lord and Stephen Tallents. 1958. Walter Elliot. 1888-1958. Biographical Memoirs of Fellows of the Royal Society. 4: 73-80. 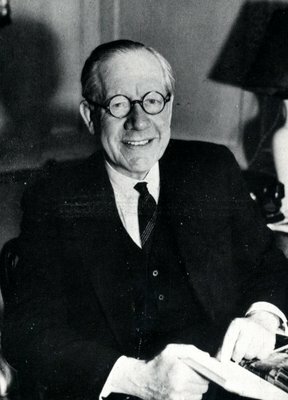 Walter Elliot, newly in opposition, introduced the Education (Scotland) Bill into the House of Commons as a private member to allow Scottish Local Education Authorities to provide free or subsidized school milk. Walter Elliot was behind the Milk Act 1934, establishing a 'Milk in Schools' scheme which by 1939 was supplying a third of a pint of milk daily to 50 per cent of primary school children in the UK. World Changing Project, "Secretary of State for Scotland 1936-1938," in University of Glasgow World Changing (University of Glasgow, 2010); http://www.worldchanging.glasgow.ac.uk/article/?id=44 (accessed April 24, 2019). World Changing Project. "Secretary of State for Scotland 1936-1938." In University of Glasgow World Changing. University of Glasgow, 2010. http://www.worldchanging.glasgow.ac.uk/article/?id=44 (accessed April 24, 2019). World Changing Project. "Secretary of State for Scotland 1936-1938." University of Glasgow World Changing. University of Glasgow, 2010. 24 April 2019 <http://www.worldchanging.glasgow.ac.uk/article/?id=44>.